IDW puts out a lot of really fun comics every month, but this past month it felt like they really knocked it out of the park with some of their new series. But before I get into which of these new series caught my eye, there were also some exciting new announcements from the games side of the company. 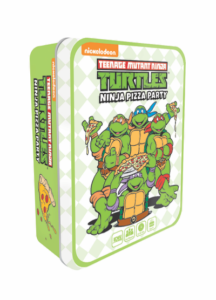 In March 2019, IDW Games will be releasing Teenage Mutant Ninja Turtles Pizza Party, a card-based game for 2-6 players, designed by the same people who created Harry Potter: Hogwarts Battle (which you should also check out if you haven’t already). In this game, you are a pizza chef creating extreme pizzas for the turtles and their friends. In addition to the regular toppings, there are more… unique ideas like toasted marshmallows, cheese puffs, and banana slices. I mentioned during last month’s pubwatch that I’m not very familiar with the Teenage Mutant Ninja Turtles. 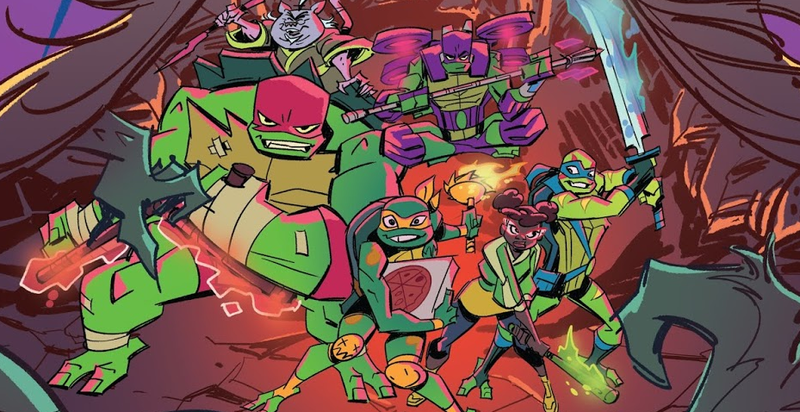 But one of the added bonuses to IDW publishing so many TMNT comics is that I’ve been spending a lot more time with them recently and I can honestly say I’m excited about this new card game. It sounds fast-paced and easy to learn, and because the focus is really on the pizza it would be fun for TMNT fans and non-fans alike. 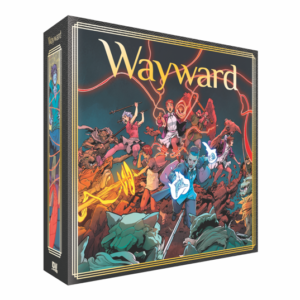 In addition to the Teenage Mutant Ninja Turtles, IDW Games is developing a game based on the comic Wayward by Jim Zubb and Steve Cummings. If you are unfamiliar with the series, it’s a supernatural comic about a group of teens in Japan who have to unlock their secret powers to fight ancient creatures hiding in the streets of Tokyo. A little bit Buffy, a little bit Hellboy, it is every bit as badass as it sounds. If you’re intrigued like me, the game will be available to order via Kickstarter this February. But if you happen to be at PAX Unplugged later this month you can also take the game for a test drive at the IDW booth (#3148). If you are like me and just getting into the TMNT, or you want to and have never known where to begin, this is an excellent starting place. This new series spins out of the recent TV show of the same name. 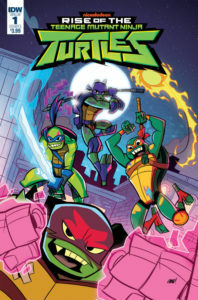 The series has a lot of the traditional elements (they’re still mutant turtles, living in New York, with awesome ninja skills) but it feels a lot more energetic than some of the other comics/shows. As you can see from the cover above, the art is very lively and the colour palette uses a lot of bright neon colours that really pop off the page. This style stays pretty consistent throughout the first issues and I imagine this would be appealing to some of the younger readers of this series. One of my favourite things about this new series, however, is the way they’ve reimagined April O’Neil. In this version of the TMNT universe, April is no longer a red-headed computer programmer. Instead, she’s a young African-American teen, who is not just an ally of the turtles but wielding a baseball bat and fighting right alongside them. And if you enjoy the first issue as much as I did I have some good news! The second issue was just released last week and is every bit as fun as the first. 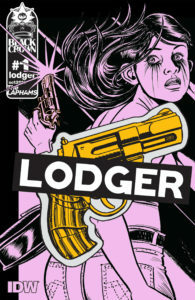 Going in a completely different direction from Rise of the TMNT, Lodger is a very dark, new noir series from IDW’s Black Crown imprint. The story follows a young woman named Ricky Toledo. Three years ago, Ricky fell hard for the man she knew as “Dante.” That is, until he killed her mother and her father took the fall. Now, determined to get revenge, she’s chasing him as he goes on a murder spree across the Midwest, posing as a travel blogger. This is a dark comic, easily the darkest comic of all the IDW comics I read in the past month, but it is impossible to put down once you start. In fact, once I finished my first reading, I immediately flipped back to the first page and started all over again. If you’re a fan of the recent wave of true crime podcasts and documentaries and enjoy books like Sadie by Courtney Summers, then I’m willing to bet you’ll have a similar experience. This one is cheating a little, as the series actually kicked off last month, but it’s such a sweet, heart-warming series that I’m going to make an exception. I also may be a bit biased as Tangled is one of my favourite Disney movies (I’ve lost track of how many times I’ve re-watched it.) 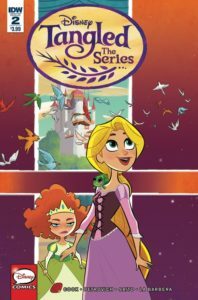 This comic series takes place after the movie ends and Rapunzel has reunited with her parents and is the princess of the kingdom once again. True to her character, she is incredibly graceful and generous, and in the second issue she uses that charm to win over another young princess who was bewitching the people of her kingdom. This is an incredibly charming, all-ages comic and one that I would be happy to share with any of the young readers in my life.